This meal has been a family favorite ever since we stepped foot into the Jamaican Jerk Hut in Philadelphia. You would enter and hear reggae music playing, something so very close to our hearts, and walk into the back yard where you could sit on a picnic bench to eat your dinner. A dimly lit garden warmed your souls as you prepared for the meal you were about to eat. 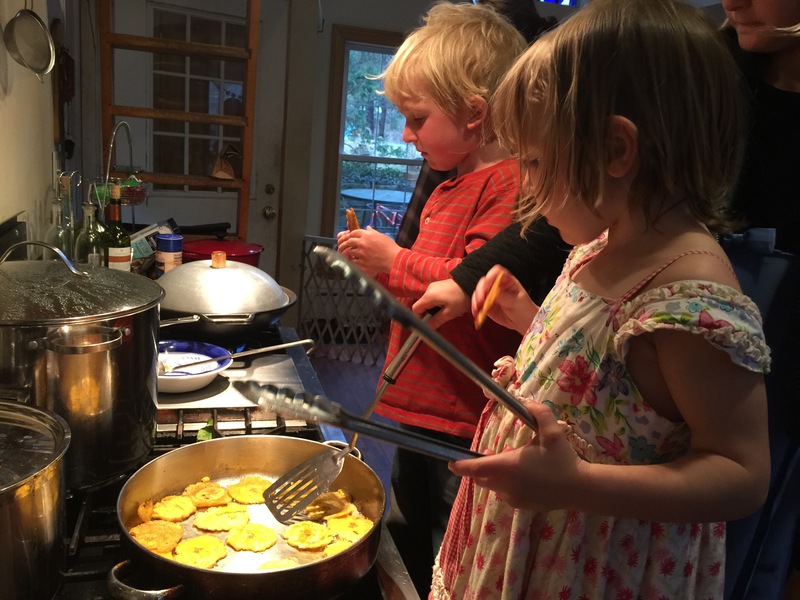 It began with an appetizer of fried plantains, salted and browned to perfection. Followed by corn chips with their special pineapple salsa, which we have since mimicked in our own way. After that you would order the oxtail, because that was the best on the menu, seasoned with allspice and Jamaican peppers with a side of rice and beans. The taste was so authentic and sure to leave you feeling like you are in the tropics. After those first few experiences at this restaurant, stirred with my love for cooking, we (as a family) decided this needed to be re-created in the comfort of our own home. And so the researching began. I found multiple recipes and combined them to get the perfect flavors. 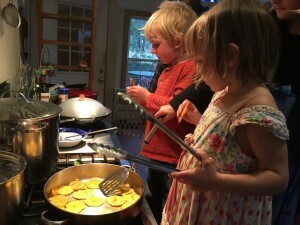 I searched for the perfect mango salsa recipe and altered it to fit the bill. I went shopping in only certain stores that carried the authentic pepper used for the dish; a scotch bonnet pepper, which turns out to be related to the intensely heated habanero. After many sparse trials over the years, (it turns out oxtails are not plentifully available for a family of 25) the recipe has finally been photographed, and is ready to share with you. We hope you enjoy making this recipe as much as we do, and enjoy eating it even more so, because the flavors just cannot be beat. We had to start cooking at 10 in the morning to give it enough time to simmer throughout the day. Notice the bacon cooking on the side? And of course the glory of getting to eat the meal once it was finished. 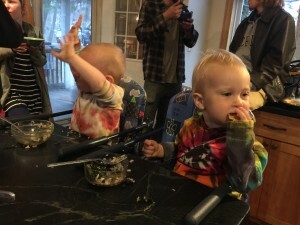 You see Wes (on the left) is singing his praises; he really loved sucking on the bones. *if you cannot find a scotch bonnet, use a habanero instead. In a large bowl combine oxtail, 1 chopped onion, green onions, garlic, ginger, thyme, soy sauce, salt and pepper and toss to coat. In a medium pan, sautee onions, carrots and celery until soft. Add 1 T tomato paste and let cook until fragrant. Add some salt and pepper and turn off. 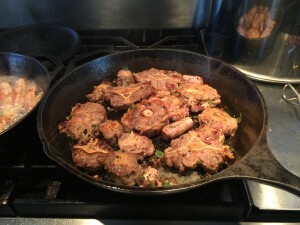 In a separate, large pan brown your oxtail on all sides and throw into your large cooking pot. 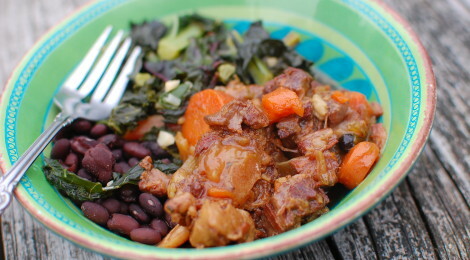 Repeat until you have browned all your oxtail. Add any leftover onions, garlic, ginger and soy sauce that was marinated in the oxtail to the pot. Add your sauteed onions, carrots and celery to the pot as well. Pour in your 5 cups of beef broth, allspice and scotch bonnet pepper (leaving it whole and keeping an eye on it so you don’t lose it in your stew!). 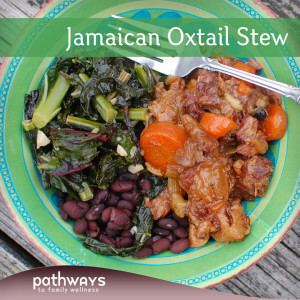 Mix your arrow root with about 1/4 cup of water and add into the stew as well. Cover and let simmer for about 6 hours or until the meat starts falling off the bone. Taste as you go and add more salt, pepper or allspice if needed. Serve with black beans, rice and dark leafy greens if desired. Note: this recipe can also be made in a slow cooker if that is easier. Simply set to low and let cook for the same amount of time. If made on the stove, be sure to use a diffuser under your pot to not burn the bottom. 1 pineapple, 1 mango, 1 bell pepper, 1 jalapeno pepper, juice of 1/2 of a lemon and 1/2 a lime, plus a handful of fresh cilantro, chopped and salted to taste – Cube all ingredients and toss together. Salt more if needed and let sit for 1/2 hour for best results.